Products that pop the ears for you. by Dr. Christopher Chang, last modified on 2/24/19. If fungal ear infections are the main concern, click here for more information. This article mainly deals with bacterial ear infections. Also, keep in mind that not all ear pain is due to ear infections. Other causes should be considered especially if ear pain persists in spite of antibiotics. 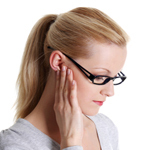 If you are interested in learning more about other causes of ear pain, click here. External ear infections, also known as Otitis Externa or Swimmer's Ear, occurs when the skin of the ear canal becomes infected and swollen. This often results in the ear canal swelling shut and is EXTREMELY painful. 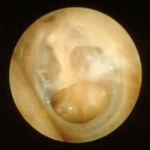 Image shown here is a severe example of this type of ear infection (Image by James Hellman, MD of Wikipedia). This condition can strike any age and gender, but is most common in people who live in warm & humid climates and in swimmers. You do NOT have to be a swimmer to get this. Treatment is antibiotic steroid ear drops (ciprodex, cipro HC, cortisporin, etc). If the ear canal is swollen shut, the drops can't get down into the ear canal. In this situation, an ear wick (or small sponge), is placed into the ear canal so that when drops are applied, the wick is able to absorb and draw the medication down into the ear. Here is an image of a wick (when the wick becomes wet, it balloons up to absorb the medication). Wicks can be purchased on Amazon as well. Oral antibiotics do not work very well in this situation. If particularly nasty infection is present, a single dose of oral steroids is quite helpful. If external ear infections keep happening, treatment is by placing 3-5 drops of half-strength acetic acid into the ear periodically, especially right after swimming. This solution is made by mixing white vinegar (used in cooking) half and half with sterile water into an empty eye dropper. Keeping the ear dry is also helpful. The ear canal is also the most common location for fungal ear infections. More info on fungal ear infections and how they are treated can be found here. Middle ear infections (also known as Otitis Media) is by far the MOST common type of ear infection, especially in children. This infection involves the space BEHIND the eardrum. Often, pus develops in this space and causes the eardrum to start bulging (just like a water balloon). If pus continues to accumulate, the eardrum will eventually rupture (just like what happens if you add too much water to a water balloon). When rupture occurs, there usually will be copious amount of drainage out the ear along with blood. Pain does improve quite a bit when this happens as the pressure has been released by the rupture. Watch a video demonstrating how an ear infection progresses over time. Using ear drops of any kind is ineffective as the drops can not get behind the eardrum to get to where the infection is located. Treatment is oral antibiotics. Keep in mind that antibiotics will NOT treat fluid itself. It will only treat the infection present in the fluid. As such, if "fluid" is present in the middle ear, but is not infected, treatment is by trying to pop the ear via nasal sprays, just as with Eustachian Tube Dysfunction. Click here to read more about this treatment. 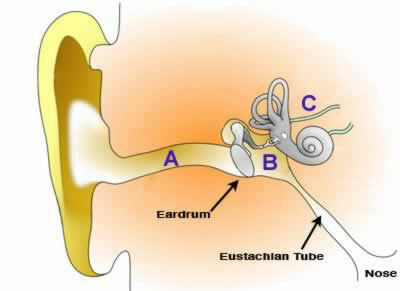 Watch a video explaining about eustachian tube dysfunction. However, if there is a perforation (or a tube present) present, one can also add antibiotic ear drops. Why? Because now that there is a hole in the eardrum, the drops can get through the eardrum and into the middle ear space where the infection is located. Watch a video demonstrating this here. More info regarding ear drops can be found here. If an ear infection occurs, the pus is now able to escape out of the ear resulting in ear drainage (this is normal!). 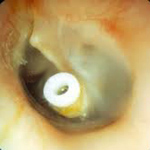 Tissue spearing can be performed to help remove this drainage prior to antibiotic ear drop placement. If middle ear infections happen often enough, placement of tubes are often helpful. Why would placing a tube help in these situations? Really, tube placement is a "detour" whereby the natural eustachian tube is bypassed so that ventilation occurs through the ear canal instead of the nose. Furthermore, a tube allows for ear popping automatically. Another way of thinking about a tube is a hole in a balloon. When there is a hole in a balloon, no pressure can build up as it would automatically escape out the hole. Read about the different types of tubes here. If the adenoids are large, they can physically block the eustachian tube leading to middle ear problems. If that's the case, adenoid removal would be an option. • Otovent or EarPopper or Eustachi (devices to help pop the ear). Watch a video how the Otovent works or how the EarPopper works. Rarely, recurrent ear infections may be due to a cholesteatoma. Keep in mind that these are just guidelines and that there are extenuating circumstances in which tube placement earlier may be justified. Click here to read more about ear tube placements. Inner ear infections are PAINLESS and almost always caused by a virus. Symptoms of inner ear infection is severe vertigo without any respite that lasts for weeks and even months. Hearing loss is common as well as tinnitus. A physician CANNOT "see" an infection involving the inner ear as the infection is located within the skull behind the ear involving the nerves going from the ear to the brain. Diagnosis is based purely on history and audiogram. Occasionally, an ENG may be ordered and if an MRI Head is obtained, inflammation of the nerve may be seen, but not always. CT scans are normal. Treatment is high dose prednisone tapered over several weeks and symptommatic care. There's not much more that can be done beyond that. Please contact our office for an appointment if you are suffering from ear infections. How Much Better are Antibiotic Ear Drops Compared to Oral Antibiotics? "Ear Picking" - A Barber Shop Service Health Hazard?